Just take a look at some of the big movers to the upside in the under-$10 complex from Wednesday, including Ultra Petroleum (UPL , which exploded by 102.6%; Rex Energy (REXX , which spiked by 35.1%; Republic Airways (RJET ,which soared by 34.7%; and Unit Corporation (UNT - Get Report) , which surged by 33%. You don't even have to catch the entire move in lower-priced stocks such as these to make outsized returns when trading. One under-$10 biopharmaceutical player that's starting to trend within range of triggering a major breakout trade is Dicerna Pharmaceuticals (DRNA - Get Report) , which focuses on the discovery and development of treatments for liver diseases and cancers based on a proprietary RNA interference technology platform in the U.S. and internationally. This stock has been smacked lower by the sellers over the last six months, with shares down large by 52.7%. If you take a glance at the chart for Dicerna Pharmaceuticals, you'll notice that this stock has been downtrending badly over the last three months, with shares collapsing off its high of $15.93 to its new 52-week low of $4.71 a share. During that downtrend, this stock has been consistently making lower highs and lower lows, which is bearish technical price action. That said, shares of Dicerna Pharmaceuticals started to bounce modestly higher on Wednesday with strong upside volume flows. Volume for that trading session registered over 150,000 shares, which is above its three-month average action of 130,375 a shares. This high-volume spike is now quickly pushing this stock within range of triggering a major breakout trade. Market players should now look for long-biased trades in shares of Dicerna Pharmaceuticals if it manages to break out above its 20-day moving average of $5.48 a share and then above more near-term resistance at $5.85 a share with high volume. Look for a sustained move or close above those levels with volume that hits near or above its three-month average action of 130,375 shares. If that breakout develops soon, then this stock will set up to re-test or possibly take out its next major overhead resistance levels at $6.29 to $7, or even $7.50 to its 50-day moving average of $7.84 a share. Traders can look to buy this stock off weakness to anticipate that breakout and simply use a stop that sits right its new 52-week low of $4.71 a share. One can also buy shares of Dicerna Pharmaceuticals off strength once it starts to take out those breakout levels with volume and then simply use a stop that sits a comfortable percentage from your entry point. 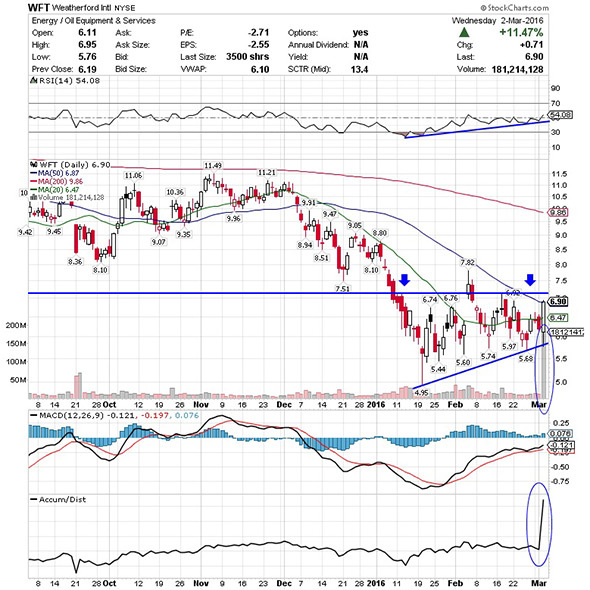 An under-$10 energy player that's starting to spike within range of triggering a big breakout trade is Weatherford International (WFT - Get Report) , which operates as a multinational oilfield service company worldwide. This stock has been smashed lower by the bears over the last three months, with shares down sharply by 35.8%. If you take a look at the chart for Weatherford International, you'll notice that this stock has been attempting to carve out a major bottoming chart pattern over the last month and change, with shares finding buying interest multiple times whenever it's traded to around $5.50 a share. Shares of Weatherford International ripped sharply higher on Wednesday back above its 20-day moving average of $6.47 a share and above its 50-day moving average of $6.87 a share with monster upside volume flows. Volume for that trading session registered over 181 million shares, which is well above its three-month average action of just 18.15 million shares. This high-volume rip is now quickly pushing this stock within range of triggering a big breakout trade. Market players should now look for long-biased trades in Weatherford International if it manages to break out above Wednesday's intraday high of $6.95 a share and then above more near-term resistance at $7.13 a share with volume. Look for a sustained move or close above those levels with volume that hits near or above its three-month average action of 18.15 million shares. If that breakout materializes soon, then this stock will set up to re-test or possibly take out its next major overhead resistance levels at $7.82 to $8.80, or even $9.50 to $10 a share. Traders can look to buy this stock off weakness to anticipate that breakout and simply use a stop that sits right below some near-term support at $6 a share or around more key support at $5.50 a share. One can also buy shares of Weatherford International off strength once it starts to clear those breakout levels with volume and then simply use a stop that sits a comfortable percentage from your entry point. Another under-$10 stock that's starting to trend within range of triggering a big breakout trade is BioDelivery Sciences (BDSI - Get Report) , which engages in the development and commercialization of pharmaceutical products principally in the areas of pain management and addiction. This stock has been under heavy selling pressure over the last six months, with shares sliding sharply lower by 36%. If you take a glance at the chart for BioDelivery Sciences, you'll notice that this stock ripped sharply higher on Wednesday right above some near-term support at $3.69 a share and back above its 20-day moving average of $3.88 a share with decent upside volume flows. This rip to the upside is now quickly pushing shares of BioDelivery Sciences within range of triggering a big breakout trade above some key near-term overhead resistance levels. Traders should now look for long-biased trades in BioDelivery Sciences if it manages to break out above its 50-day moving average of $4.10 a share and then once it clears some more key near-term resistance levels at $4.25 to $4.26 a share with high volume. 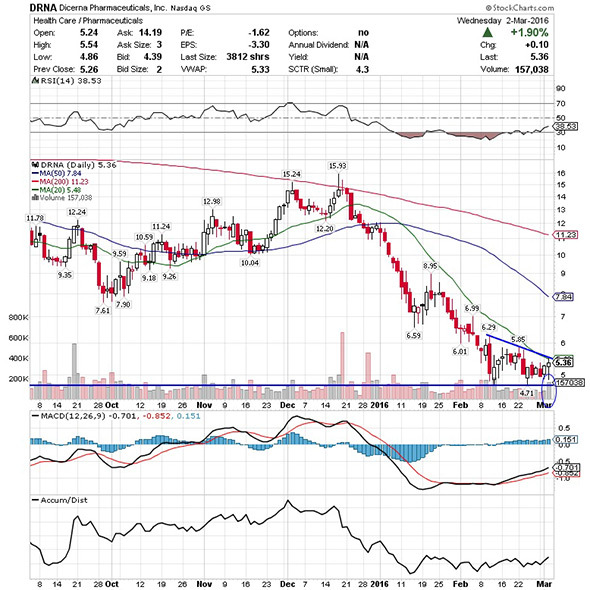 Look for a sustained move or close above those levels with volume that registers near or above its three-month average action of 1.16 million shares. 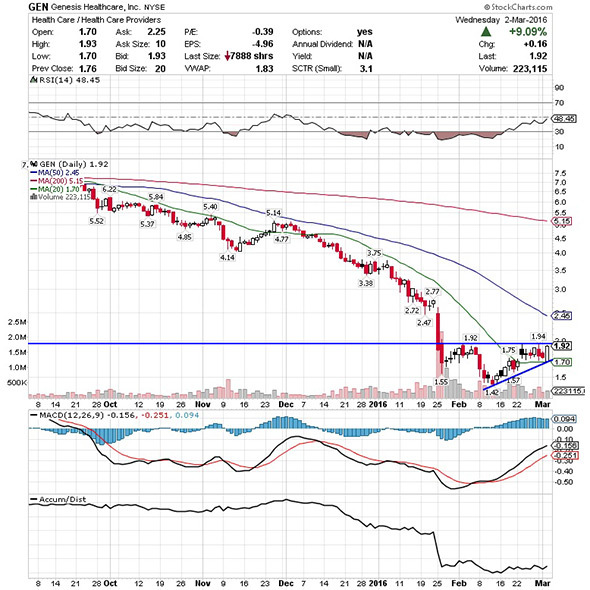 If that breakout hits soon, then this stock will set up to re-test or possibly take out its next major overhead resistance levels at $4.90 to $5.25, or even $5.50 to $6 a share. Traders can look to buy this stock off weakness to anticipate that breakout and simply use a stop that sits right below some key near-term support levels at $3.69 to $3.50 a share. One can also buy shares of BioDelivery Sciences off strength once it starts to take out those breakout levels with volume and then simply use a stop that sits a comfortable percentage from your entry point. Another under-$10 health care player that's starting to rip up within range of triggering a major breakout trade is Genesis Healthcare (GEN - Get Report) , which provides post-acute care services through a network of skilled nursing centers and assisted/senior living communities in the U.S. This stock has been destroyed by the sellers over the last six months, with shares off large by 73.8%. If you look at the chart for Genesis Healthcare, you'll notice that this stock ripped sharply higher on Wednesday right off its 20-day moving average of $1.70 a share with lighter-than-average volume. This stock has been uptrending strong over the last few weeks, with shares moving higher off its new 52-week low of $1.42 a share to its recent high of $1.94 a share. During that uptrend, shares of Genesis Healthcare have been making mostly higher lows and higher highs, which is bullish technical price action. This spike to the upside on Wednesday is now quickly pushing this stock within range of triggering a major breakout trade above some key near-term overhead resistance levels. Market players should now look for long-biased trades in Genesis Healthcare if it manages to break out above some near-term overhead resistance levels at $1.94 to $2.03 a share with high volume. Look for a sustained move or close above those levels with volume that registers near or above its three-month average action of 328,593 shares. If that breakout fires off soon, then this stock will set up to re-test or possibly take out its next major overhead resistance levels at its 50-day moving average of $2.45 to $2.75, or even $3 a share. Traders can look to buy Genesis Healthcare off weakness to anticipate that breakout and simply use a stop that sits right below its 20-day moving average of $1.70 a share or around more support at $1.57 a share. One can also buy this stock off strength once it starts to trend above those breakout levels with volume and then simply use a stop that sits a comfortable percentage from your entry point. 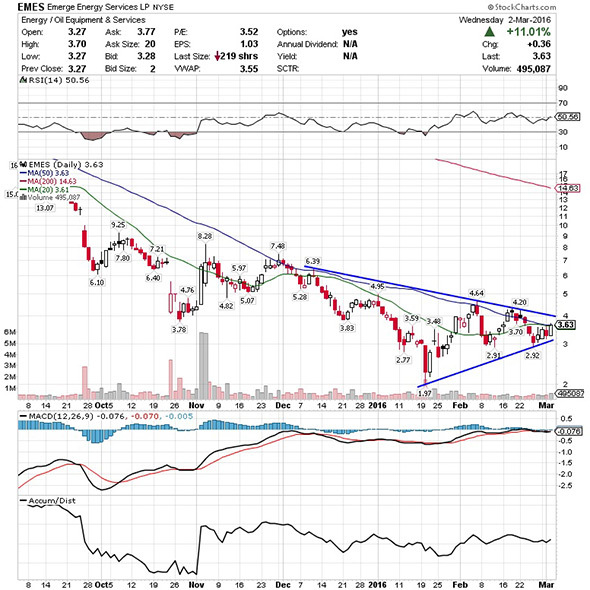 One final under-$10 stock that's starting to trend within range of triggering a near-term breakout trade is Emerge Energy Services (EMES , which acquires, owns, operates and develops a portfolio of energy service assets in the U.S. This stock has been hammered lower by the bears over the last six months, with shares off huge by 77.3%. If you take a glance at the chart for Emerge Energy Services, you'll notice that this stock recently carved out a double bottom chart pattern, after shares found some buying interest at $2.91 to $2.92 a share. Following that potential bottom, this stock has now started to spike higher and test both its 20-day moving average of $3.61 a share and its 50-day moving average of $3.63 a share with decent upside volume flows. Volume on Wednesday registered over 495,000 shares, which is above its three-month average volume of 470,574 shares. This high-volume spike is now quickly pushing shares of Emerge Energy Services within range of triggering a near-term breakout trade. Traders should now look for long-biased trades in Emerge Energy Services if it manages to break out above Wednesday's intraday high of $3.70 a share to some more near-term resistance at $4 a share with high volume. Look for a sustained move or close above those levels with volume that hits near or above its three-month average action of 470,574 shares. 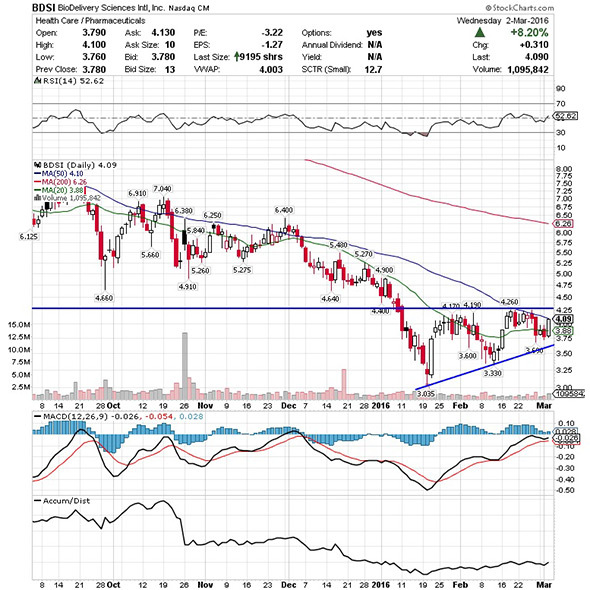 If that breakout takes hold soon, then this stock will set up to re-test or possibly take out its next major overhead resistance levels at $4.20 to $4.64, or even $4.95 to around $5.50 a share. Traders can look to buy shares of Emerge Energy Services off weakness to anticipate that move and simply use a stop that sits right below Wednesday's intraday low of $3.27 a share or around those recent double bottom support levels. One can also buy this stock off strength once it starts to bust above those breakout levels with volume and then simply use a stop that sits a comfortable percentage from your entry point. Disclosure: This article is commentary by an independent contributor. At the time of publication, the author was long DRNA.